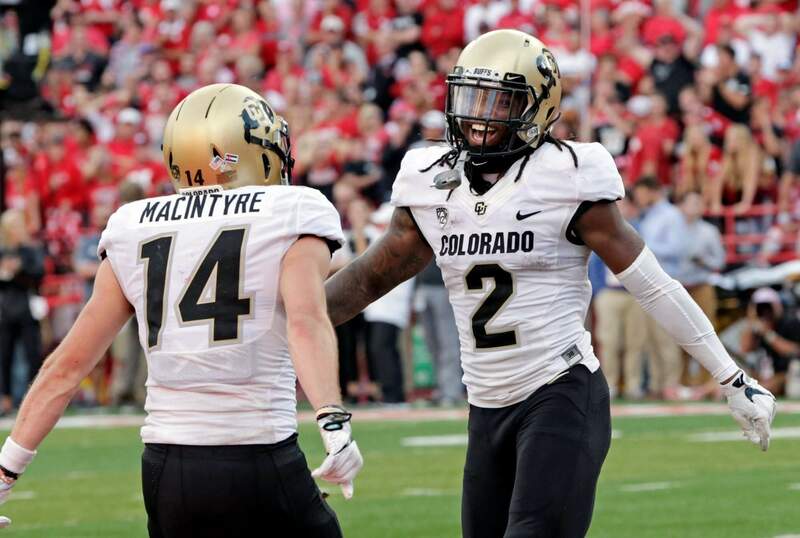 Colorado wide receiver Laviska Shenault Jr. celebrates with wide receiver Jay MacIntyre after he caught the go-ahead touchdown against Nebraska during the second half last week at Nebraska. BOULDER – The Colorado Buffaloes knocked off an in-state rival and a former Big 12 foe. Now they tackle their next mogul: A perennial adversary on the ski slopes. The Buffaloes will try to improve to 3-0 for the second consecutive year when they host FCS New Hampshire (0-2) on Saturday. The Wildcats and Buffaloes have never met on the field but plenty of times on the snow. They’re two of the top programs in the country in ski racing. Colorado is coming off wins over Colorado State in Denver and Nebraska in Lincoln. This marks the first time the program has started 2-0 without one of them being a victory in Boulder since 1920. New Hampshire is a contender on the FCS level and has been to the playoffs the last 14 seasons under coach Sean McDonnell. The Buffaloes are 5-2 against FCS schools. Part of the reason for Colorado’s explosiveness is the play of receiver Laviska Shenault. His 388 yards receiving over the past two games (211 against the Rams, 177 versus the Cornhuskers) is the second-most in back-to-back games in Colorado history. The record belongs to Paul Richardson, who had 417 in 2013. He’s now playing for the Washington Redskins. In MacIntyre’s estimation, the secret to Shenault’s success has got to be the hair. The Wildcats know they have their work cut out for them in stopping a Colorado offense that’s accumulated 991 yards through two games. TACKLING MACHINEInside linebacker Nate Landman was named the Bronco Nagurski defensive player of the week after a performance against Nebraska that included 14 tackles, three third-down stops, an interception and a forced fumble. SPECIAL TEAMS Punter Alex Kinney broke his collarbone in the win over Nebraska, while kicker James Stefanou tweaked his groin. Stefanou missed 37- and 43-yard field goals. “He’s an excellent kicker and I guarantee he’ll make those kicks when he’s completely healthy,” MacIntyre said. Davis Price will take over the punting duties. PAC-12 This will be the Wildcats’ first time facing a Pac-12 football squad. They beat an FBS school in Georgia Southern last season, 22-12. TEAMMATE AWARDThe New Hampshire football program recognizes one of its players through the Todd Walker Teammate Award. It’s in honor of Todd Walker, a former Wildcat who was killed in Boulder in 2011 when he was trying to protect a female friend. Walker attended Battle Mountain High School in Edwards, Colorado. The award has been presented annually since 2011, with tight end John DiCaro receiving the honor last season. THIS & THATThe Wildcats lost to Maine and Colgate by a combined score of 45-10. ... New Hampshire went 9-5 last season in advancing to the FCS quarterfinals. ... Buffaloes QB Steven Montez was the Maxwell Award player of the week after throwing for 351 yards and three TDs against the Cornhuskers.